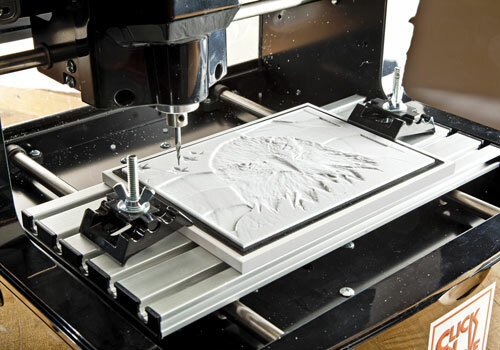 Rockler has just introduced the Click-N-Carve, a compact CNC routing machine that turns digital input into detailed carvings. Click-N-Carve is a user-friendly version of more complicated CNC machines, boasting the ability to translate digital photographs and other coded input into extremely intricate carvings in just minutes - everything from signs to cabinet doors and more. 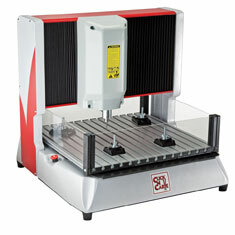 They also cost much less than larger CNC units on the market. 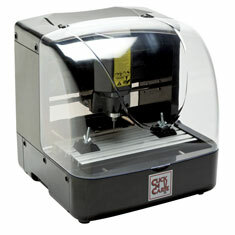 There are two models of the Click-N-Carve - the BE2015 and the BE3030. The BE2015 is the base model, which features travel dimentions of approximately 8.7in (X) x 6.3in (Y) x 2.5" (Z). The BE3030 features larger travel dimensions (approximately. 11.8in (X) x 11.8in (Y) x 4" (Z)) and a more powerful motor to drive the carving operations at a greater speed. Both models come with a lengthy list of accessories including a USB cable and controller, silicone work mat, four clamps - two small and two large - two Tungsten Carbide carving bits, eight sample acrylic workpieces and a how-to video to get started.